A group of college students fly to South America so they can stage a protest against illegal deforestation in the Amazon jungle. After a plane crash leaves them stranded, one of the native tribes they were trying to protect takes them captive and begins doing some really bad things to them. Sorry Mr. Roth but this was a terrible movie. I had low expectations going in and understood the acting and story would both be pretty sub par, but I figured there would at least be plenty of gore and scares to go around which is kind of the point. There were a few moments here and there, but nothing we haven't already seen and Roth failed to create any real tension or suspense. To make things worse, the entire cast just looked confused and awkward throughout most of the movie and at times I had a hard time figuring out whether I was watching horror or comedy. I mean, resorting to a diarrhea joke in the middle of what is supposed to be a pretty tense moment just made everything real weird and was also the point where I lost all hope and just accepted what this was going to be. Fortunately, it wasn't too long before the movie came to an abrupt and unexpected (not in a good way) conclusion and I was able to exit the theater without too much harm done. 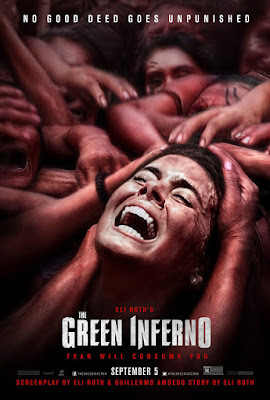 The Green Inferno has been advertised and hyped up as a shockingly horrific blood bath the likes of which we've never seen before. It's not. It does however feature a heavy dose of disappointment.